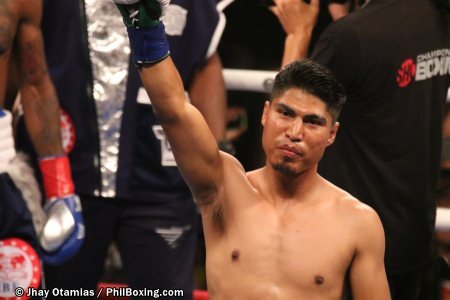 STAPLES CENTER, LOS ANGELES -- Mikey Garcia drops Robert Easter Jnr late in round three with a right left combo but could not finish the job. 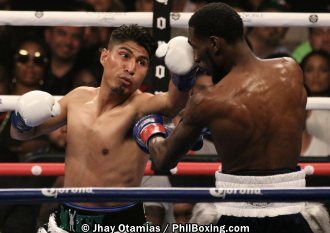 Easter survived by his long left jabs and his legs alone and had no answer to Garcia’s relentless attack to close the gap. He could not hurt Garcia with his occasional hits. As the championship rounds came it was obvious that Garcia is a class above Easter. Easter just didnt have enough to beat Garcia. Easter’s best round was the early part of round 9 when he momentarily stuns Garcia during a torrid exchange at ring center. But Garcia recovered n took the later part of round. In the end Garcia took the fight with the scores as follows: 116-111, 117-110, 118-109. Garcia (39-0-0, 30Kos) is now the unified WBC/IBF world lightweight champion. Easter suffered his first loss and dropped to 21-1-0, 14KOs.